Should You Buy Your Omni Yoga Swing From Deity Health Or The Creator? 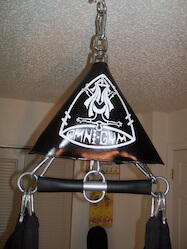 Where Can You Get The Best Deal On Your Omni Yoga Swing? So… You want a Yoga Swing, but you want to make sure you’re getting a great deal. I understand that, and I’m going to give you some insight to help you decide where and how to get yours. I have the Omni Yoga Swings on Deity Health and you can always save 5% by using the coupon code I’ll provide you with, but there’s more to it than that, so please read on. To be clear, you can get your Yoga Swing direct from Tone Cardenas, the creator, by Clicking Here. When you use these links, he’ll know I sent you, and that is good for all of us. So there is NOT an ongoing discount at the Yoga Swing Creator’s website, but sometimes Tone has Sales that will save you more than 5% on your Swing. Lucky for all of us, I have included a page on this website that tells about current Yoga Swing sales. You can view that page here, and as long as there is a sale going on you’ll find it listed at this link…. But there’s more to know. You can get on my Yoga Swing Subscribers List at this page HERE, and I’ll send you an email when there’s a new video to watch, and when there is a SALE on Yoga Swings. But there’s still more. When you buy your yoga swing from Deity Health, you save 5% on the cost of any Yoga Swing, the Omni Gym Complete, and other Yoga Swing Packages. Let Me Show You A Cost Comparison For The Omni Swing Deluxe. 407.25 = 375.25 + 32.00 You Can See You Save 19.75 At Deity Health With The Discount! A final Word Before You Get Your Yoga Swing! If you decide to get your Yoga Swing or Omni Gym Complete at Deity Health, Please use the following discount code at checkout to make sure you get the best deal. Enter the code at checkout and then click apply. Get Your Yoga Swing At Deity Health Here. Get Your Yoga Swing From Tone Here.